The power of visibility cannot be underestimated. It attracts the attention of the customers and it’s essential to maximize sales. Some Belgian entrepreneurs understood it a while ago when they decided to create Moonfox. They are developing and selling cardboard packaging, displays & dump bins in an ecological and socially responsible way: using green electricity, LED eco UV lamps, and recycling the residual waste. 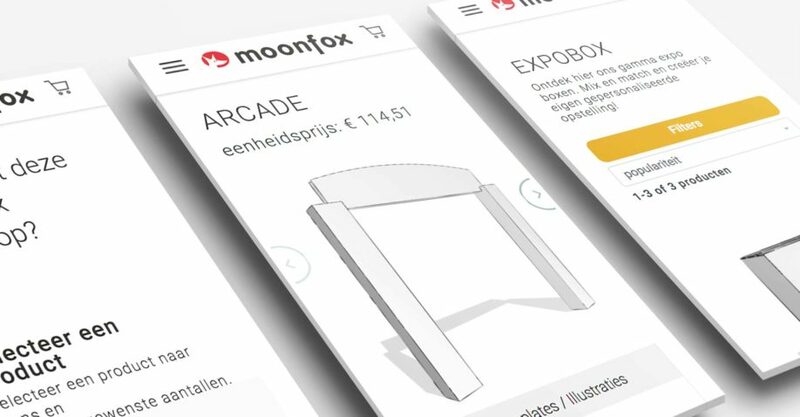 Moonfox is a family business who focuses on producing displays and point of sales products for businesses on the Belgian market. They decided they want to build a platform from where they can sell online. The goal? To attract new customers and secondary to allow existing customers to easily order their displays and Point Of Sales materials online, through an automated portal instead of having to go through a classic process of requesting a quote, delivering source files and then giving final approval for purchase & production on paper or e-mail. The challenge was to build a platform that would fit all the functionalities needed, in a simple, responsive and intuitive interface. Our custom development team created the products in the back office, the CMS functionality, the product catalogue, the checkout flow, the admin order management & the SEO requirements. All the products can now be edited and previewed in 3D so that both technical and non-technical customers can be served. The marketing team provided the development team with an “SEO checklist” in order to properly document the implementation needed. Google Analytics, Google Tag Manager and Bing & Google Webmaster Tools are the tools we prefer to implement from the start. Relying on accurate data is a must for each business owner and marketer alike. We made sure the tracking is on point and Moonfox is ready to make waves in the advertising industry. In order to finish setting the accounts for the live webshop, it’s imperative for the website to be live. For a few days, the webshop was in soft-live. What does it mean? We didn’t promote it or bring any traffic until we made sure everything works just perfect. We prepared the advertising campaigns and scheduled them according to our schedule and the budget approved by our client.